Even though I’m only 8 years old, I still think most of the sounds I hear in my household are very sweet… The big band jazz tunes of Krupa, Goodman, Dorsey and Miller in the living room. The Beatles, The Monkees, The Rascals, and The Stones blaring from my sister’s room … In the bedroom I share with my older brother, blues and modern jazz is the scene. My brother is also a guitar player. He started playing about a year before I was born… Man, the sweet soulful sounds that resonated in my room! Then I heard him sing… Well let me just say… Not so sweet! Our dog wasn’t overwhelmed either. Ya dig? My brother and his musician friends would rehearse on Saturday afternoons in our basement. They were going through some tunes from an LP they just bought. It was entitled Boogie with Canned Heat, and it was the band’s second record. The guys started to joke around and made a suggestion that my brother sing “On The Road Again” a tune from their latest acquisition. The song was a cover of an old 1950’s tune by Floyd Jones… Not one to normally accept a vocal challenge, he confidentially accepted. All of a sudden something really neat happened… If I had closed my eyes I would have thought the stylus was snug in its vinyl groove. My brother and his friends captured the song brilliantly; instrumentally and vocally. was formed in Los Angeles in 1965 by blues enthusiasts Alan Wilson and Bob Hite. They got their name from Tommy Johnson’s 1928 song Canned Heat Blues. It makes references to an alcoholic drinking Sterno, or more commonly called “Canned Heat.” At least that’s what my brother’s friends tell me. I ask them lots of questions about the music they play… Who sing or plays what? Cover tunes or originals? Where were they from? How many other people know them? You know… those types of questions… the ones writers like, but will throw a musician off; especially when they’re just about to play. Adolfo (‘Fito’) de la Parra: drums. Their third album, Living The Blues, included another blues incarnation turned hit. It was a Henry Thomas tune called Bulldozer Blues. Wilson took the original song, rewrote the lyrics and came up with Going Up The Country. A song many consider their personal hippie theme song. Of course when Canned Heat’s new LP came out, the boys were set to rehearse. And my brother took another shot at singing. Going Up The Country then became the second song I heard my brother sing lead to. Once again the guys nailed it! I knew right then that music was going to factor into my future somehow… How? Was only a matter of time? I just finished typing the last few words and now I’m back to staring at my laptop screen… I’m rubbing my eyes trying to focus on the words above. The Blues Blogger needs to get some sleep… It’s interesting to note that I only made my brother aware of my site several weeks ago. Some of the articles featured here I’m sure he finds very interesting. This one I think I’m getting a call on shortly… Oh well… What else can I tell ya? I have a crazy fever, man. There is so much one can write regarding Canned Heat and the memories of yesteryear. 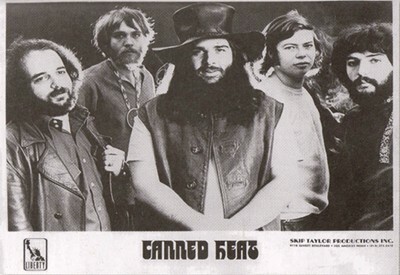 This post is only a brief personal flashback to a moment I captured in time… Perhaps that’s where you blues/rock/boogie fans can help fill in the gaps… Where were you back when Canned Heat was making their impact on the world? Please add your comments below and let’s generate some discussion on this historical band. Thank you for the great trip down memory lane. Great post – and, I hope you feel better real soon!